The following bulletin was obtained from the website of the California Fire Chiefs Association. 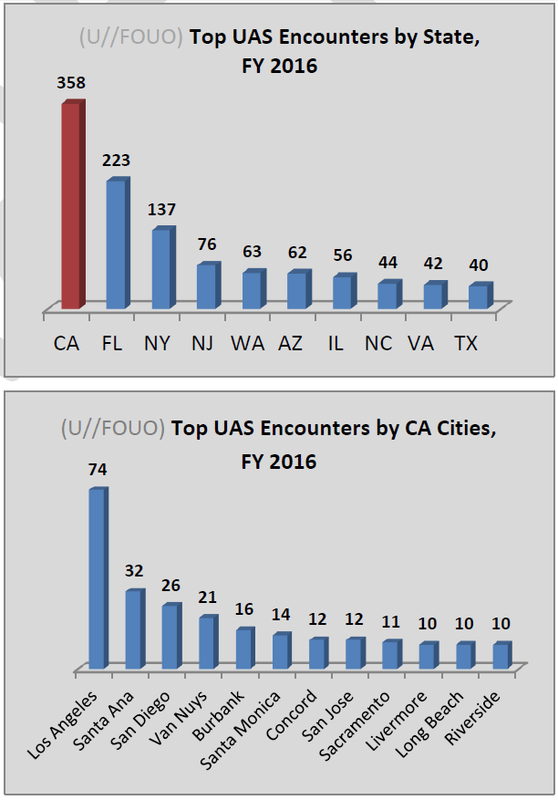 (U//FOUO) California has had more disclosed unauthorized Unmanned Aircraft Systems (UAS) encounters than any other state between October 2015 and September 2016—accounting for 21 percent of the reported encounters nationwide—according to the Federal Aviation Administration (FAA). These encounters continue to pose a direct risk to public safety air assets. • (U//FOUO) California had 358 of the approximate 1744 reported encounters nationwide. • (U//FOUO) Encounters were reported in 64 California cities, with the most incidents in Los Angeles (74), Santa Ana (32), and San Diego (26). 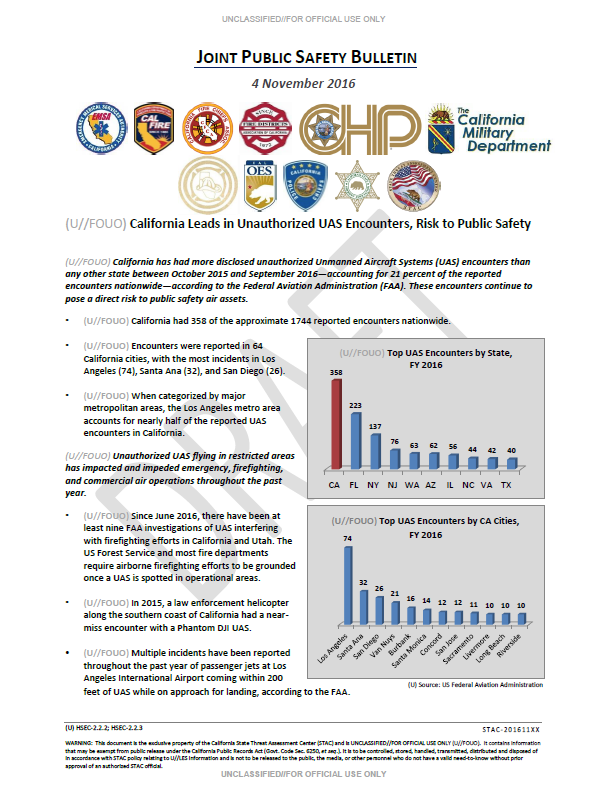 • (U//FOUO) When categorized by major metropolitan areas, the Los Angeles metro area accounts for nearly half of the reported UAS encounters in California. (U//FOUO) Unauthorized UAS flying in restricted areas has impacted and impeded emergency, firefighting, and commercial air operations throughout the past year. • (U//FOUO) Since June 2016, there have been at least nine FAA investigations of UAS interfering with firefighting efforts in California and Utah. The US Forest Service and most fire departments require airborne firefighting efforts to be grounded once a UAS is spotted in operational areas. • (U//FOUO) In 2015, a law enforcement helicopter along the southern coast of California had a nearmiss encounter with a Phantom DJI UAS. • (U//FOUO) Multiple incidents have been reported throughout the past year of passenger jets at Los Angeles International Airport coming within 200 feet of UAS while on approach for landing, according to the FAA.